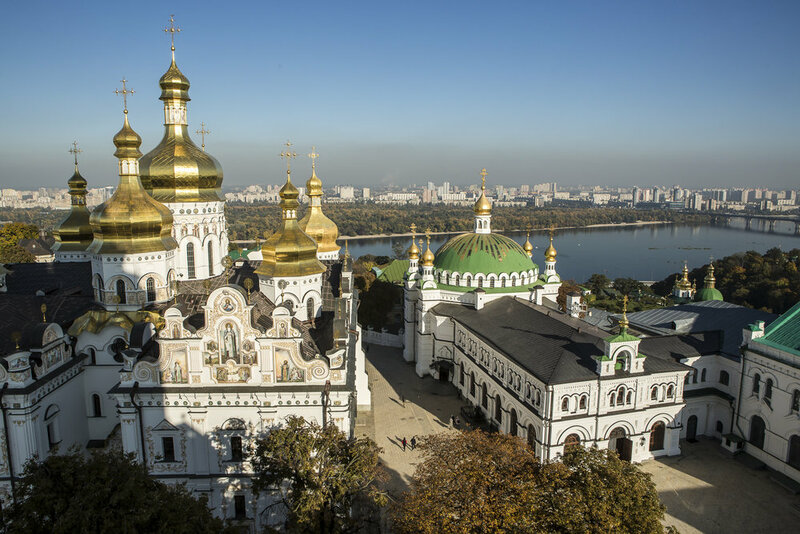 The Kyiv-Pechersk Lavra is the crown jewel of the Orthodox Church in Ukraine, a complex housing numerous churches, an active monastery, a theological academy, museums, and a network of underground caves containing saintly relics. Its history stretches back nearly a thousand years and it draws pilgrims and worshippers from around the world. The Lavra itself falls under the jurisdiction of Moscow, as that has been the only officially recognized branch of the Orthodox Church in Ukraine for centuries, and its fate following the establishment of an official Ukrainian church is contentious. 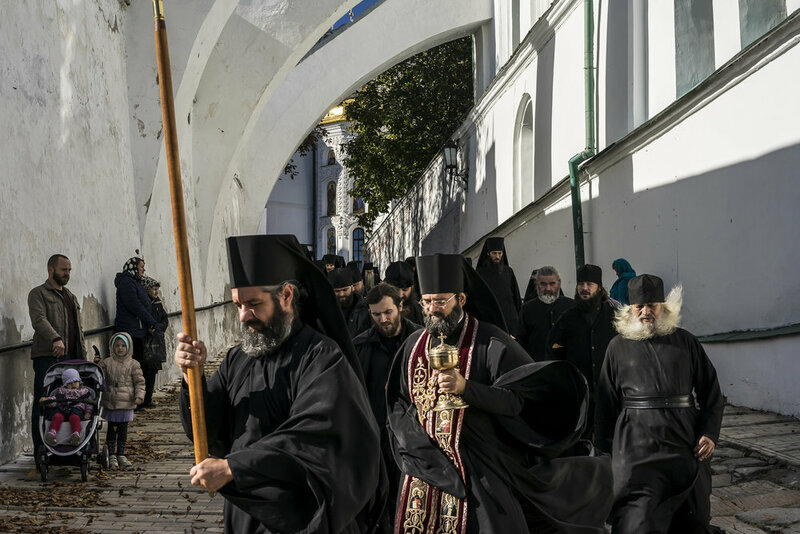 This is a look at life in the Lavra, guided by ancient tradition and spirituality. The Holy Dormition Cathedral, left, and the Refectory Church of Sts. Anthony and Theodosius as seen from the Great Lavra Bell Tower at the Kyiv-Pechersk Lavra on Wednesday, October 10, 2018 in Kyiv, Ukraine. Father Ilya holds Alisa, age three months, following her baptism at the Life Spring Church at the Kyiv-Pechersk Lavra on Saturday, October 6, 2018 in Kyiv, Ukraine. Monks process from the Refectory Church of Sts. Anthony and Theodosius to the refectory for a communal meal at the Kyiv-Pechersk Lavra on Sunday, October 7, 2018 in Kyiv, Ukraine. Priests and deacons during Sunday Liturgy services at the Refectory Church of Sts. Anthony and Theodosius at the Pechersk Lavra on Sunday, October 7, 2018 in Kyiv, Ukraine. Worshipers at a Bishop's Mass at the Refectory Church of Sts. Anthony and Theodosius at the Kyiv-Pechersk Lavra on Saturday, October 6, 2018 in Kyiv, Ukraine. Father Philip conducts the wedding of Yevgeny Bolonnikov, second from left, and Katerina, third from right, at Life Spring Church at the Kyiv-Pechersk Lavra on Sunday, October 7, 2018 in Kyiv, Ukraine. 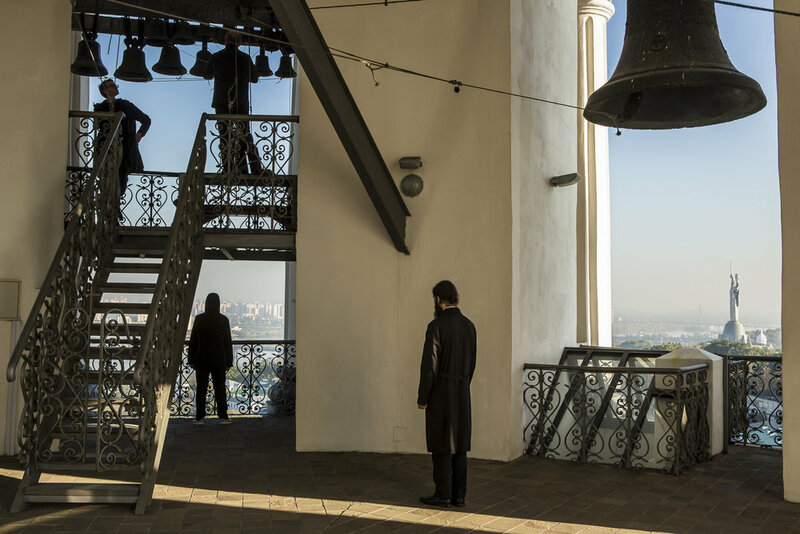 Sergei, left, who works at the Kyiv-Pechersk Lavra, and Bogdan, right, a student at the Kyiv Theological Academy, ring the bells of the Great Lavra Bell Tower on Wednesday, October 10, 2018 in Kyiv, Ukraine. 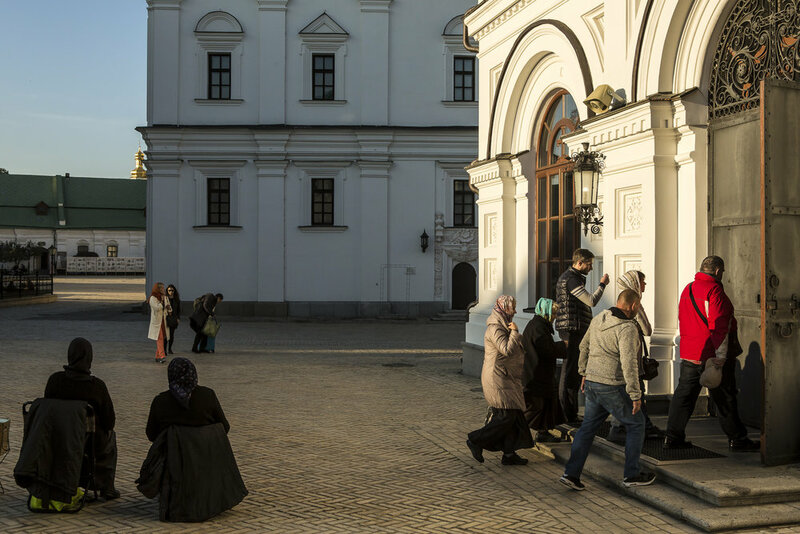 People listen to the ringing of the bells inside the Great Lavra Bell Tower at the Kyiv-Pechersk Lavra on Wednesday, October 10, 2018 in Kyiv, Ukraine. People enter the Refectory Church of Sts. Anthony and Theodosius for the Evening Divine Office at the Kyiv-Pechersk Lavra on Wednesday, October 10, 2018 in Kyiv, Ukraine. Monks and deacons enter during the Brethren service at the Church of the Exaltation of the Cross at the Kyiv-Pechersk Lavra on Saturday, October 6, 2018 in Kyiv, Ukraine. 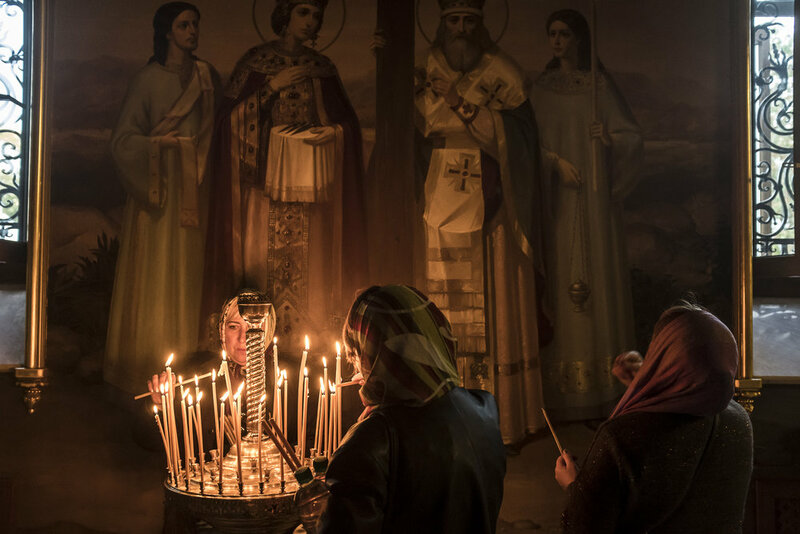 Women light candles during the Brethren service at the Church of the Exaltation of the Cross at the Kyiv-Pechersk Lavra on Saturday, October 6, 2018 in Kyiv, Ukraine. 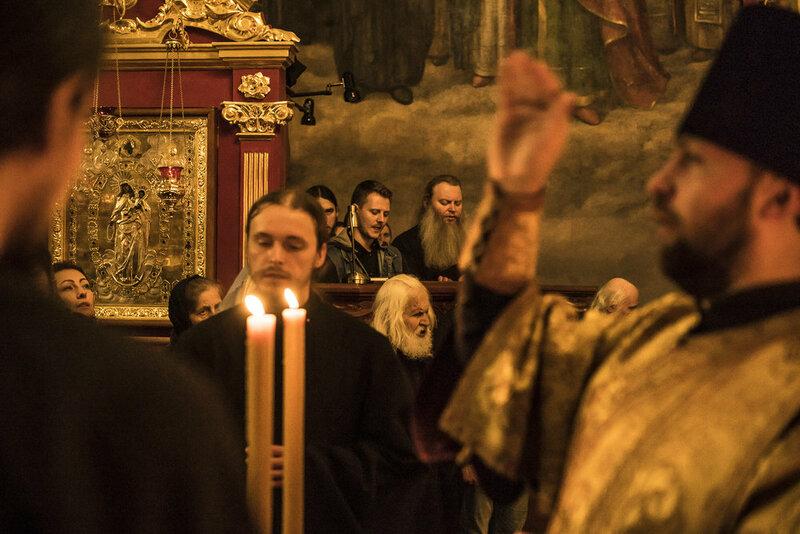 First Deacon Father Agapit, right, leads the Brethren service at the Church of the Exaltation of the Cross at the Kyiv-Pechersk Lavra on Saturday, October 6, 2018 in Kyiv, Ukraine. 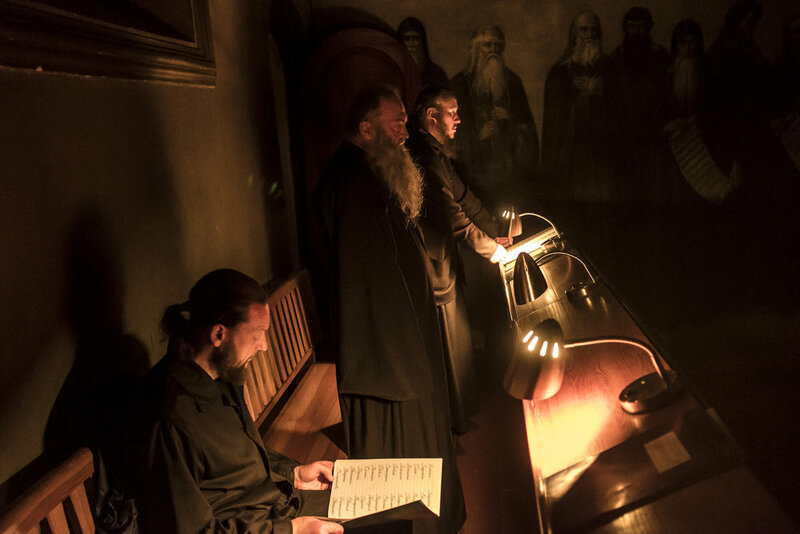 A Liturgy service is held starting at 1am in the church of St. Theodosius located in the far caves of the Kyiv-Pechersk Lavra on Thursday, October 11, 2018 in Kyiv, Ukraine. Members of the choir of the Kyiv Theological Academy during Sunday Liturgy services at the Refectory Church of Sts. Anthony and Theodosius at the Kyiv-Pechersk Lavra on Sunday, October 7, 2018 in Kyiv, Ukraine. Monks pray during the Brethren service at the Church of the Exaltation of the Cross at the Kyiv-Pechersk Lavra on Saturday, October 6, 2018 in Kyiv, Ukraine. Father Ilya prepares to baptize Alisa, age three months, at the Life Spring Church at the Kyiv-Pechersk Lavra on Saturday, October 6, 2018 in Kyiv, Ukraine. Godmother Ala Oriekhovych tries to comfort Alisa, age three months, in her mother Taisia Melnyk's arms, during her baptism at the Life Spring Church at the Kyiv-Pechersk Lavra on Saturday, October 6, 2018 in Kyiv, Ukraine. Father Philip, left, leads Katerina, second from left, and Yevgeny Bolonnikov, third from left, during their wedding at Life Spring Church at the Kyiv-Pechersk Lavra on Sunday, October 7, 2018 in Kyiv, Ukraine. People pray over sacred relics following a Liturgy service held starting at 1am in the church of St. Theodosius located in the far caves of the Kyiv-Pechersk Lavra on Thursday, October 11, 2018 in Kyiv, Ukraine. A monk and a nun walk through the darkened streets after leaving a mass at the Kyiv-Pechersk Lavra on Saturday, October 6, 2018 in Kyiv, Ukraine. 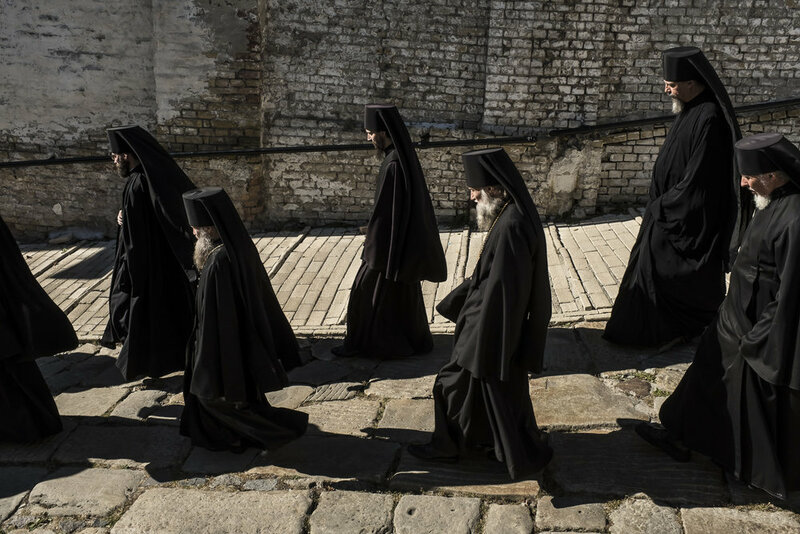 On October 11, 2018, the Ecumenical Patriarchate of Constantinople announced its support for Ukraine’s effort to create an independent Ukrainian Orthodox Church, moving out from under Moscow’s authority for the first time since 1686. It’s a development with long historical roots that was finally realized due to current political tensions between Ukraine and Russia, and it has incensed the Russian Orthodox Church, who may break from the church leadership in Istanbul in Christianity’s biggest rupture in a thousand years. The Kyiv-Pechersk Lavra is the crown jewel of the Orthodox Church in Ukraine, a religious complex housing numerous churches, an active monastery, a theological academy, museums, and a network of underground caves containing saintly relics. Its history stretches back nearly a thousand years and it draws pilgrims and worshippers from around the world. The Lavra itself falls under the jurisdiction of Moscow, as that has been the only officially recognized branch of the Orthodox Church in Ukraine for centuries, and its fate following the establishment of an official Ukrainian church is contentious. 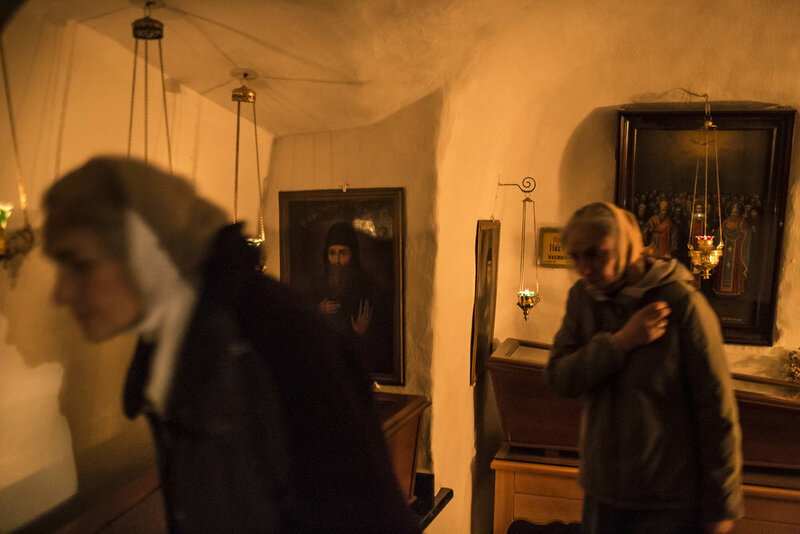 This is a look at life in the Lavra, guided by ancient tradition and spirituality.